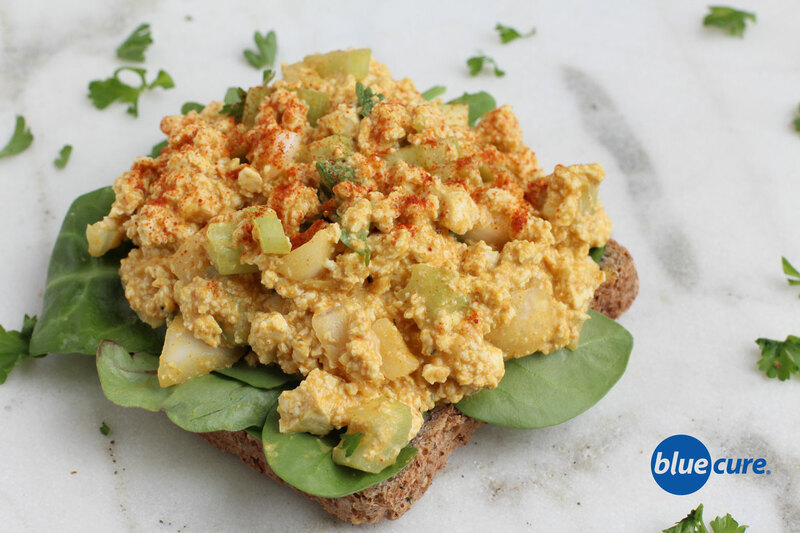 A lighter ‘egg’ salad sandwich that still has that classic egg salad sandwich taste. 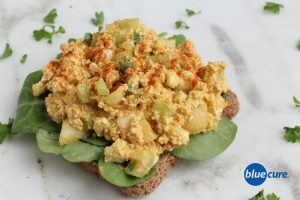 This eggless ‘egg’ salad is made with tofu instead of eggs and hummus or baba ganoush instead of mayo. Creamy, crunchy, tangy, and oh so delicious! Open the tofu and discard any water. Optional to press out the extra water in the tofu using a clean towel. Place the tofu in a bowl. Using a fork, mash the tofu to desired texture. Wash and chop the onion, celery, and parsley. Add to the bowl with the tofu. Add the hummus or baba ganoush, lemon juice, mustard, paprika, turmeric, and black pepper. Stir together the ingredients until well combined. Wash and chop the greens. Toast the bread. Layer the ingredients on the sandwich and enjoy!